In Matter of Clark v New York State Dept. of Motor Vehs., the defendant was ticketed after a police office saw him driving with a handheld GPS in his hand. The defendant took the ticket to trial, arguing that use of the GPS wasn’t prohibited under the law. A DMV ALJ wasn’t buying it, he was convicted, and the DMV Appeals Board rejected his appeal. The Appellate Division, Third Department held that the DMV’s interpretation of the statute to criminalize the use of a handheld GPS while driving was rational. 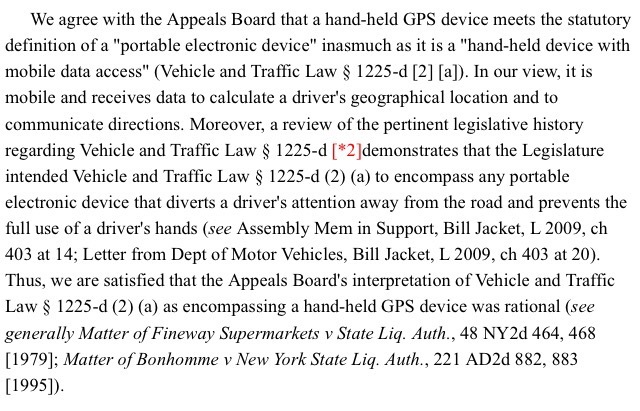 The Court reasoned that the GPS fit within the statutory definition of a “portable electronic device” because “it is mobile and receives data to calculate a driver’s geographical location and to communicate directions” (Opn, at *1). The Court’s review of the legislative history underlying the statute confirmed that the Legislature meant to prohibit broadly the use of any mobile device that distracts a driver’s attention from the road and prevents the use of both hands while driving. So, the Court held, the handheld GPS fit the bill, and the defendant’s conviction was therefore affirmed. The Third Department makes it very clear that it is not going to upset the Legislature’s and DMV’s attempts to make New York roads safer from distracted drivers. Simply put, don’t use any handheld device while driving. If you do, you won’t find any comfort in the courts.